VMware is the global leader in cloud infrastructure and business mobility and a member of the Dell Technologies family of businesses. With VMware solutions, organizations are improving business agility by modernizing data centers, driving innovation with modern data and apps, creating exceptional mobile experiences, and safeguarding customer trust with a defense-in-depth approach to cybersecurity. The legal department at VMware includes 166 people in 25 cities across 16 countries, led by Vice President and Deputy General Counsel, Aine Lyons. For the last five years, Ms. Lyons has taken on the challenge of driving operational excellence as the head of legal operations. One of Ms. Lyons’ first initiatives at VMware was searching for technologies that could automate some of their current data capture processes. At the top of their needs list was a way to uncover the data that would help them better collaborate and negotiate with their law firms. They also struggled with knowing for sure whether outside vendors were actually complying with the discounts and alternative fee arrangements VMware had negotiated with them. Ms. Lyons and her team embarked on a very detailed RFP process, evaluating many vendors across the market to uncover the right e-billing and legal management tool. According to Ms. Lyons, it was a clear choice from an operations perspective. Being a global company, the legal team had to address implementation on an international basis. Although they knew such a rollout would present more challenges, it was yet another reason for choosing CounselLink as their ELM solution. One advantage with CounselLink is that it offers support for paper invoices submitted by international and domestic law firms. The CounselLink services team processes and electronically uploads the paper invoices into the application. All the charges, down to the line item detail, are then available for VMware to view within CounselLink. That means VMware gets a granular view into individual charges, along with the ability to report, track and benchmark their total spend. The customer service team is also available 24/7 to help CounselLink law firms with their questions, including how to submit invoices, whether LEDES or paper, resulting in faster payment and more efficient processes. Ms. Lyons can tick off a long list of monetary advantages they’ve gained from CounselLink. 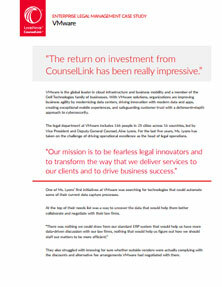 But according to Ms. Lyons, the continued benefit CounselLink has provided is the value the VMware legal department has been able to demonstrate to their management team and across the enterprise. “For the broader company, I think we’ve built our reputation as being very fiscally-responsible,” she said. As you might have surmised, Ms. Lyons is very happy with how her company has benefited from CounselLink. Ms. Lyons and her team know first-hand how the changes required to make technology implementations successful in a legal department can be a challenge. That’s why she believes in CounselLink. A global and diverse team, the legal department at VMware is comprised of 166 people in 25 cities across 16 countries. To achieve continued success as fearless legal innovators, the team knew the data collection from their limited ERP system would not offer the detailed insights to meet their needs. They wanted an ELM solution that could provide access to the metrics they needed to drive strategic spend decisions and help “transform the way that we deliver services to our clients and to drive their business success”. The CounselLink solution is an Enterprise Legal Management solution suite for legal spend management, matter management, legal hold, analytics, and strategic consulting services. The solution has earned an industry reputation for enabling corporate law departments to use data effectively as a basis for improving legal department performance and outcomes.